Since you're here you probably want to know a little about me. Well, I'm an Anglo-American who moved to the US in early adulthood. I've lived in Florida almost ever since and I try not to go anywhere where the temperature is below fifty degrees. Since early childhood I've always written something, but once out on my own, working for a living and having fun in my spare time left little room for anything else, so it wasn't until much later that I started to write novels. Mystery was my first choice but I'm a bit of a butterfly and have oodles of ideas for different genres, which means that unlike a lot of writers, I will probably continue to experiment in different fields. One on my list at some point is to write a Florida historical novel. I might try most things but I don't think I'll ever write romance. My mother read so many of those when I was growing up that I developed an aversion to them. What else would you like to know? Favorite things? 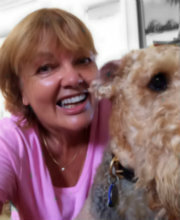 My Airedale Terrier, Jake. There have been very few times in my life when I was without a four-legged furry friend. Cats, not so much, though growing up we always had one, along with mice, an injured barn owl, a pony and various other stray critters. Chocolate is high on the list. I'm an avid reader but confess to only reading nonfiction when I want to learn something. I love the occasional weekend getaway to new places, mostly local, and quiet time to sit in the sun enjoying nature or puttering in the garden. Pet peeves - unwanted phone calls and salespeople at my door.